Leymah Gbowee was born in central Liberia on 1 February 1972. At the age of 17, she was living with her parents and two of her three sisters in Monrovia, when the First Liberian Civil War erupted in 1989, throwing the country into chaos until 1996. “As the war subsided she learned about a program run by UNICEF,… training people to be social workers who would then counsel those traumatized by war,” wrote Gbowee in her 2011 memoir, Mighty Be Our Powers. She did a three-month training, which led her to be aware of her own abuse at the hands of the father of her two young children, son Joshua “Nuku” and daughter Amber. Searching for peace and sustenance for her family, Gbowee followed her partner, called Daniel in her memoir, to Ghana where she and her growing family (her second son, Arthur, was born) lived as virtually homeless refugees and almost starved. She fled with her three children, riding a bus on credit for over a week “because I didn’t have a cent,” back to the chaos of Liberia, where her parents and other family members still lived. The THRP’s offices were new, but the program had a history. Liberia’s churches had been active in peace efforts ever since the civil war started, and in 1991, Lutheran pastors, lay leaders, teachers and health workers joined with the Christian Health Association of Liberia to try to repair the psychic and social damage left by the war. As she studied and worked her way toward her associate of art degree, conferred in 2001, she applied her training in trauma healing and reconciliation to trying to rehabilitate some of the ex-child soldiers of Charles Taylor’s army. Surrounded by the images of war, she realized that “if any changes were to be made in society it had to be by the mothers”. Gbowee gave birth to a second daughter Nicole “Pudu”, making her the mother of four, as she engaged in the next chapter of her life’s journey rallying the women of Liberia to stop the violence that was destroying their children. How to describe the excitement of that first meeting…? There were women from Sierra Leone, Guinea, Nigeria, Senegal, Burkina Faso, Togo almost all the sixteen West African nations. In her quietly brilliant way, Thelma had handwritten an organizer’s training manual with exercises that would draw women out, engage them, teach them about conflict and conflict resolution, and even help them understand why they should be involved in addressing these issues at all. In the sympathetic setting of other women hungry for peace, Gbowee told the painful parts of her life story for the first time, including sleeping on the floor of a hospital corridor with a newborn baby for a week because she had no money to pay the bill and nobody to help her. “No one else in Africa was doing this: focusing only on women and only on building peace.” Ekiyor became Gbowee’s trainer and friend. She also was the one who announced the launch of WIPNET in Liberia and named Gbowee as coordinator of Liberian Women’s Initiative. Gbowee’s “peace-church” philosophical orientation likely can be traced to this era Thelma Ekiyor, Rev. “BB” Colley, Samuel Gbaydee Doe, and Hizkias Assefa are all connected to Eastern Mennonite University in the United States, either as former students or (in Assefa’s case) as an ongoing professor. In the spring of 2002, Gbowee was spending her days employed in trauma-healing work and her evenings as the unpaid leader of WIPNET in Liberia. Her children, now including an adopted daughter named Lucia “Malou” (bringing the number of children to five), were living in Ghana under her sister’s care. Falling asleep in the WIPNET office one night, she awoke from a dream where she says God had told her, “Gather the women and pray for peace!” Some friends helped her to understand that the dream was not meant for others, as Gbowee thought; instead, she realized that it was a necessary for her to act upon it herself. Following a WIPNET training session in Liberia, Gbowee and her allies, including a Mandingo-Muslim woman named Asatu, began by “going to the mosques on Friday at noon after prayers, to the markets on Saturday morning, to two churches every Sunday.” Their flyers read: “We are tired! We are tired of our children being killed! We are tired of being abused!! Women, wake up you have a voice in the peace process!” They also handed out simple drawings explaining their purpose to the many women who couldn’t read. In her book, Gbowee reveals that Grace Minor quietly “gave a great deal of her own money… at enormous personal risk” to the women’s protest movement. The protesting women extracted a promise from President Charles Taylor to attend peace talks in Ghana to negotiate with the rebels from Liberians United for Reconciliation and Democracy and another newer rebel group, MODEL. In addition to helping bring an end to 14 years of warfare in Liberia, this women’s movement led to the 2005 election of Ellen Johnson Sirleaf as president of Liberia, the first elected woman leader of a country in Africa. Sirleaf is co-recipient of the 2011 Nobel Peace Prize along with Gbowee and Tawakel Karman. The three were awarded the prize “for their non-violent struggle for the safety of women and for women’s rights to full participation in peace-building work.” In Sirleaf’s re-election campaign of 2011, Gbowee endorsed her. A war of fourteen years doesn’t just go away. In the moments we were calm enough to look around, we had to confront the magnitude of what had happened in Liberia. Two hundred and fifty thousand people were dead, a quarter of them children. One in three were displaced, with 350,000 living in internally displaced persons camps and the rest anywhere they could find shelter. One million people, mostly women and children, were at risk of malnutrition, diarrhea, measles and cholera because of contamination in the wells. More than 75 percent of the country’s physical infrastructure, our roads, hospitals and schools, had been destroyed. A whole generation of young men had no idea who they were without a gun in their hands. Several generations of women were widowed, had been raped, seen their daughters and mothers raped, and their children kill and be killed. Neighbors had turned against neighbors; young people had lost hope, and old people, everything they had painstakingly earned. To a person, we were traumatized. By the late fall and winter of 2003-04, “the world of conflict resolution, peace-building and the global women’s movement” was calling Gbowee to write papers, come to conferences and otherwise explain the experience and views of WIPNET. Thelma Ekiyor encouraged Gbowee to overcome her lack of self-esteem among “highly intelligent people who held master’s degrees and represented powerful institutions” by reading and studying further to understand the theories circulating in the world of peacebuilding. She read The Peace Book by Louise Diamond, known for advocating multi-track diplomacy, and The Journey Toward Reconciliation and The Little Book of Conflict Transformation, both written by John Paul Lederach, the founding director of the Center for Justice and Peacebuilding at Eastern Mennonite University. She went to a USAID conference in New York, her first trip out of Africa, to a conference in South Africa, and to Switzerland where she dealt with the Nigerian in charge of UN programs in Liberia. At graduate school, I could feel my mind expand, my comprehension deepen. I realized I now could put a formal name, “strategic peacebuilding,” to what I’d done instinctively in Liberia…. Many of the other students at EMU had lived through conflict, and there was relief in being among them…. In Harrisonburg, a small old city in the Shenandoah Valley, far from Liberia and its sorrows and people who expected something from me, I didn’t have to be strong. Every now and then for instance, when I saw a mother with her children I would burst into tears. No one at EMU thought that was strange. I met an old man who’d lost his entire family in the Rwandan genocide. In September 2006, just as Gbowee was embarking on her first full semester of graduate school, she went to New York City to address the UN on the occasion of the fifth anniversary of the passage of Resolution 1325, which dealt with protecting women from gender-based violence and involving them in UN-linked peace efforts. While in New York, she received a call from Abigail Disney, a descendant of the founders of the Walt Disney Company, a feminist, and a philanthropist. Disney and a collaborator, Gini Reticker, wanted to talk with Gbowee about their desire to make a documentary about how the women of Liberia rallied themselves to force the men to stop battling. During 2006-07 Gbowee also began talking with Ekiyor and Ecoma Alaga (a Nigerian, like Ekiyor) about splitting WIPNET from WANEP, believing the parent organization to be controlled financially by men and wanting the three of them to be fully in charge. The founding director of WANEP, Gbowee’s old friend Sam Gbaydee Doe, was sympathetic to the three women’s desire for structural independence, but he had left WANEP to pursue a PhD in England. WANEP was now led by another graduate of the MA in conflict transformation program at EMU, Emmanuel Bombande of Ghana, who did not agree that the three women owned the WIPNET branch of WANEP and thus would not let it spin off. As a result, Gbowee and her two colleagues started a new organization, Women in Peace and Security Network (WIPSEN), also based in Accra, Ghana.” Abigail Disney stepped up to help Gbowee raise funds for launching WIPSEN among philanthropists in New York, enabling her to secure $50,000 in seed money. By the time Gbowee finished her coursework at EMU on April 30, 2007, and returned to her children in Liberia in May 2007 where her parents had been caring for them she realized that her nine months away “nearly broke all of us.” In Virginia, she had lived with “a cold that never went away” and she “felt panic, sadness, and cold, swirling blackness” as she faced “being sued by former friends at WANEP over our desire to move in a new direction.” Her impending graduate degree (conferred at the end of 2007), growing fame, and other changes in her life strained the relationship she had with a Liberian man named Tunde, an employee of international agencies who had functioned as a father figure for her children for a decade, from the early period of the Liberian women’s peace movement through Gbowee’s graduate studies at EMU (for which he had paid the tuition). They broke up and by early 2008 Gbowee was in a relationship with a Liberian information technology expert whom she identifies as James. He is the father of her sixth child, a daughter named Jaydyn Thelma Abigail (nicknamed “Nehcopee”), born in New York City in June 2009. Gbowee told the EMU students that she went from being an angry, broke, virtually homeless, 25-year-old mother of four children with no idea of what her future might be, to listening to the voice of God in 1997. She said God spoke to her through a five-year-old boy, a son whom she had nicknamed Nuku. Comments made by Nuku made her realize that she had succumbed to “crippling hopelessness”, and that her low self-esteem and sense of helplessness were destroying her family, which was already under assault from Liberia’s brutal warfare. Gbowee said she began taking one tiny step at a time, asking for God’s help with each step. And that God sent her angels in the form of human beings who reached out a hand at just the moment when she was most desperate. It could be Jesus, it could be Mohammed, it could be Buddha, but there is no way that you can effect change in people’s lives if there is not someone that you can rely on as the “divine intervenor” or the “divine one” that you can call on every day…. God is faithful, whoever you know him to me…. Take a step of faith and God will see to the rest. Gbowee’s exposure to the New York philanthropic social set, facilitated by Disney (who had become a close friend), opened the door for a series of awards. The first, from the John F. Kennedy School of Government at Harvard, came in early 2006, and then they began to arrive in accelerated fashion: recognition by Women’s eNews, the Gruber Prize for Women’s Rights, the John F. Kennedy Profile in Courage Award, the Living Legends Award for Service to Humanity, and several more. In July 2011, EMU announced that Gbowee had been named its “Alumna of the Year”. (Gbowee’s eldest son, Joshua “Nuku” Mensah, entered EMU as a freshman in 2010, overlapping by one year with Sam Gbaydee Doe’s eldest daughter, Samfee Doe, then a senior.) The crowning honor came in October 2011 when the Norwegian Nobel Committee made Gbowee one of three female recipients of the 2011 Nobel Peace Prize. 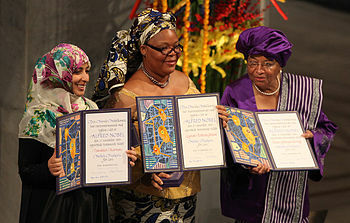 From left to right:Tawakkul Karman, Leymah Gbowee, and Ellen Johnson Sirleaf display their awards during the presentation of the Nobel Peace Prize, 10 December 2011 (Photo:Harry Wad). 2009 John F. Kennedy Profile in Courage Award. 2009 “Honor Award for Courageous Commitment for Human Rights of Women” by the Filmfestival Women’s Worlds, TERRE DES FEMMES, Germany. Associate of Arts degree in social work (2001) from Mother Patern College of Health Sciences in Monrovia, Liberia. Leymah Gbowee is the founder and president of “Gbowee Peace Foundation Africa” based in Monrovia which provides educational and leadership opportunities to girls, women and the youth in Liberia. She is the former executive director of the Women Peace and Security Network Africa, based in Accra, Ghana, which builds relationships across the West African sub-region in support of women’s capacity to prevent, avert, and end conflicts. She is a founding member and former coordinator of the Women in Peacebuilding Program/West African Network for Peacebuilding (WIPNET/WANEP). She also served as the commissioner-designate for the Liberia Truth and Reconciliation Commission. For the 20132015 academic years, she is a Distinguished Fellow in Social Justice at Barnard College of Columbia University. In 2013, she became an Oxfam Global Ambassador. She currently serves on the boards of the Nobel Women’s Initiative, the PeaceJam Foundation, and is a member of the Ara Pacis Initiative and the High Level Task for the International Conference on Population and Development. She speaks internationally to advance women’s rights, and peace and security. In 2016, Gbowee spoke at a protest march organized by Women Wage Peace, a political grassroots group working to advance a peace agreement between Israel and Palestine. Gbowee is also an outspoken supporter of the non-profit organization A New Dimension of Hope, a foundation which builds schools in her home country of Liberia. In May 2015, she wrote personal letters to the contributors of NDhope’s crowd-funding campaign on Indiegogo. As of April 2017, Gbowee is also Executive Director of the Women, Peace and Security Program at Columbia University.